A health alert has been declared in Paraguay in a bid to stop a new outbreak of dengue fever. Health workers have detected some 150 suspected cases of the mosquito-borne disease so far this year. A senior Paraguayan official said there was concern that neighbouring Brazil had also seen a recent rise in dengue and some dozen cases of yellow fever. Last year, 17 people died from dengue fever in Paraguay and the authorities were criticised for not acting sooner. "Dengue is defeated in the streets. We can fight the mosquitoes, chiefly by getting rid of stagnant pools of water," said Paraguayan President Nicanor Duarte as the health alert was declared. His government was accused of missing warning signs in January a year ago and failing to tackle the disease properly. A total of some 27,000 cases were registered during 2007, 17 of them fatal. The Paraguayan Health Minister, Oscar Martinez, said the latest suspected cases were being analysed. 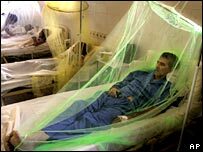 "We have 11 confirmed cases after the initial tests, and so we will wait a fortnight to carry out a second test to confirm whether it is dengue," he told the BBC. "We're asking people to support us and help us get rid of places where mosquitoes can breed," he said. Officials say their concern is that people who were infected last year might be more susceptible to more serious forms of the disease. There is a much greater risk of dengue haemorrhagic fever or dengue shock syndrome when a person has immunity to one of the other types of dengue virus as a result of previous infection.